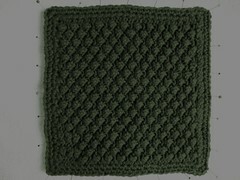 This square knit up way smaller than the others, which I’m sure is because of the pucker from the type of stitch. I could have easily made it 1 1/2” bigger on all sides. Let’s see so for my gauge on size 5 is 4” = 18sts and 28rows but since I only wound up with a square that was 7 1/2” that makes my gauge more like 4”= 21.25 st and 34 rows. So theoretically if I want a square in this pattern to end up being 9” on both sides I would need to cast on 48sts and work the pattern over 76 rows. Anyway, I wound up building up the edges with some single crochet. It looks ok, but I’ll probably re-do it. The pattern is within the All About Aran project.